We love to have these greatest ever debates. Who’s better, Michael or Kobe? Kobe or LeBron? LeBron or Michael? What’s the difference? There has been another valuable teaching moment from this free agency circus that mercifully will be reaching a conclusion Thursday night with James’ nationally televised announcement of his destination. I know the difference between Jordan and James, other than one winning championships in college and the NBA and the other winning on every level but college and the pros. Michael Jordan would never make a spectacle of himself as James is doing with enthusiasm for his Thursday night show. Jordan sold a lot of products and I probably got him in trouble some when I noted his joking remark that Republicans buy sneakers, too. Michael was not a political guy. And the way it has gone perhaps he was right. But Jordan always understood you don’t denigrate the game to enhance yourself, which is what James has done. I know, so where is he going? Miami was working right up to the moment Thursday afternoon to produce more salary cap room with reports of a trade. I have heard at least Houston being involved and perhaps Jordan’s Bobcats. The latest speculation has been James to the Miami Heat, which, actually, I think I’d enjoy in a perverse way like the old line about it being like a traffic accident—sort of horrible, but you cannot look away. The teaming of Dwyane Wade, Chris Bosh and James would be the coup of a free agency and the story of the next season. I personally cannot see James going there, if only for the reason that someone who books a TV show for himself to announce his decision—with I heard now just a part of the proceeds going to charity—is not someone who’s going to join two other stars, one of whom already has a championship and would be the more popular and powerful figure on the team. After all, Miami is Wade’s team and Wade’s town, and guys like James generally have been the types who need to dominate their team. If James hadn’t to the extent he did in basically not listening to coaching maybe the Cavs would have won a title already and James wouldn’t have to be looking elsewhere. Or maybe James has learned that he needs to be coached and held accountable and his CEO leadership of the Cavs was counterproductive. Still, the teaming of those three ball-oriented high scoring stars seems in basketball terms a poor fit. It reminds me some of the Atlanta Hawks of the late '80s who tried a similar approach with Moses Malone, Dominique Wilkins and Reggie Theus, all high scoring, ball control guys of the era. It produced a 52-win season, but broke up quickly, though those players were older at the time. There have been star groupings that have succeeded. Dr. J’s 76ers with Moses and Andrew Toney got it done, but only once, and they had a great ballhandler and unselfish guard in Mo Cheeks and dirty work guy in Bobby Jones. The Lakers won with Magic, Worthy and Kareem, but Magic was a setup man, ballhandler who worked to make everyone better. The Celtics had a big three in the Bird era, but Bird was a point forward as well, great passer, and the anchor of the team. And his point guard, Dennis Johnson, was a future Hall of Famer. LeBron has that unselfish element in him, but to be the star he seems to need to be the scoring is vital. Would he defer in a setup role like Scottie Pippen did in order to see Wade and Bosh gain higher numbers, and, thus, more MVP votes? 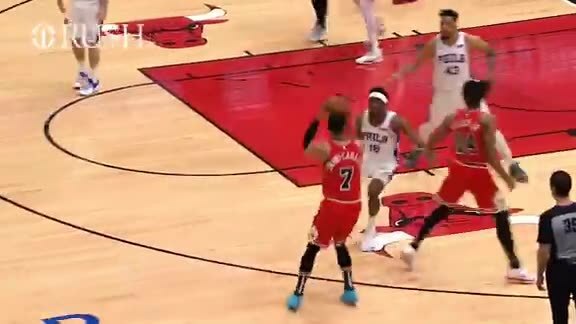 Look, this is the guy who quit on the Raptors last season when they had a chance to make the playoffs, and even James during the Bulls playoff series said he was glad they were playing the Bulls because he’d watched Toronto and they didn’t look like they even wanted to be in the playoffs and this series would be more fun with the Bulls. And what’s the rest of that Miami roster? I saw a report of Miami offering Mike Miller a deal, which would only be possible without James or if the trio played for mid level salaries. No, that’s not happening. Though I had to laugh reading reports that James’ posse guys were calling around the league to round up players, allegedly for Miami. Yes, you’d love to see Pat Riley having to answer to Maverick Carter. Frankly, and this is not because I write on Bulls.com because everyone should know I’ve long doubted LeBron would come to the Bulls. But LeBron has his best shot to win and be a star with the Bulls. Yes, Derrick Rose is on the way to bigtime stardom as well, but he also is a point guard with that mentality. He’ll set guys up. If someone could shoot last season he’d have averaged a double/double. You’ve got Noah, a willing dirty work guy, Luol Deng, a solid contributor who doesn’t need plays and Boozer who can spread the floor and run pick and roll with the best of them. Even James commended Taj Gibson during the playoff series. That James took time out to recognize a player who isn’t a star suggests James understood how tough a guy Gibson is and how well he played. No matter how he’s conducted himself and no matter how this has all gone, you know you’d still love to have him. After all, it’s sports, and he’s the best talent in the NBA. The Bulls loved Dennis Rodman after they couldn't stand him. The Bulls are hardly optimistic James will choose them, but they have the cap room with Boozer’s $75 million deal to make James a max offer, and winning in a major market like Chicago would increase James’ profile and international profit capability immensely. C’mon, seriously, Miami? Yes, there are a lot of half dressed women around all winter, which really is quite nice. But if the Heat win it hardly would be LeBron’s win but him having to go to Miami to have Wade and Bosh get him a win. As an aside, I don’t see how Wade and Bosh could say to themselves, even with LeBron, they are better off with Miami’s roster than Chicago’s. Which does suggest this was set a long time ago and much of what went on has been posturing. New York has been mentioned, and maybe LeBron believes he’s won 60 games with nobody, so now with Stoudemire he could do at least the same. Assuming Stoudemire doesn’t need microfracture surgery again. Now, that would be a risk. If you are worried about not winning in Cleveland, try not winning in New York when you call yourself the king and still in seven years are working on winning your first game in the Finals. Really, you’d have a hard time finding many stars in NBA history who have accomplished as little thus far in their careers as James in big games. In seven years, he’s made the Finals once, and then got swept. Yes, he may understand he does need help, and need it badly. The Nets have started to sign players, so they probably are out, and the Clippers likely are out because they are the Clippers. I’ve long believed the best choice for James, the one I would make if I were him, would be to return to Cleveland. He’s beloved. It’s home, which unlike some NBA players he doesn’t run from. He’s got a good coach now in Byron Scott. He’s got a deep roster and the possibility with an owner who will spend anything to make more happen in the future. His teams have won at least 60 games the last two seasons, and had he not quit in Game 5 of the Conference Finals for some reason, maybe the Cavs would have made the Finals. And never would a critical word be spoken. Which is why I almost would enjoy in a perverse way seeing James go to Miami. With those three they’d be made favorites immediately and could only fail, and it could only be LeBron’s fault since Wade won with Antoine Walker and Gary Payton and a skeleton of Shaq. And if he can’t win now with Bosh and LeBron, well, whose fault do you suppose that would be? Losing, and in Miami, where they sometimes even open up the upper deck to fans? Yes, they’d be a hot ticket next season with those talented three. I’d watch. But I can’t go outside in the winter, anyway. How big are winter sports when you can be out water skiing at the same time? Now, that’s a place where they really don’t show up until the fourth quarter because that’s when it gets dark and you have to bring the boats in. I admit, it could be a terrific place to live, and I am quite sure Joakim Noah vacations there. But is that home? Is that where you make your mark to become an international sports billionaire? You’ve got to give the guy credit. He knows how to be a show pony. But who really wants to be one if you have any dignity? Maybe I answered the question.